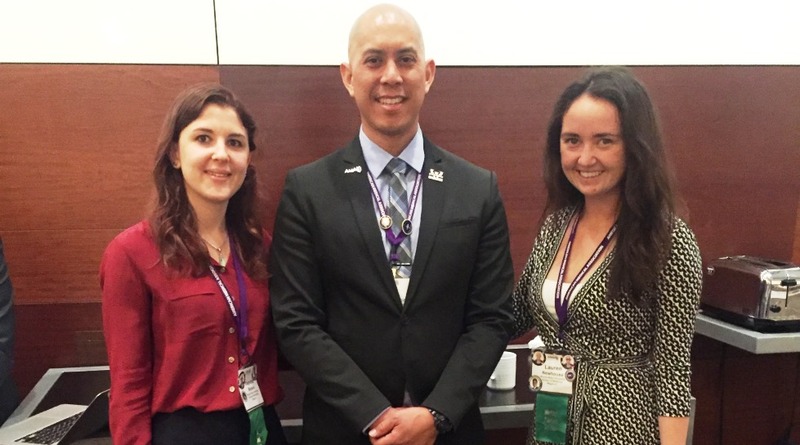 Wayne State University's American Medical Association Chapter includes, from left, medical students Tabitha Moses, Jay Llaniguez and Lauren Newhouse. Sixteen students from the Wayne State University School of Medicine represented the university at the annual meeting of the American Medical Association Medical Student Section, held June 8-10 in Chicago, where more than 600 students from across the country met to discuss and vote on 50 student-authored policies. Wayne students were responsible for two successful policies at the meeting. The policies, adopted by the AMA Medical Student Section, were meant to guide elected student delegates in the physicians' House of Delegates meeting held June 10-14. In addition, School of Medicine M.D./Ph.D. candidate Jay Llaniguez was elected national vice speaker of the House for the AMA Medical Student Section for a one-year term through June 2018. "Jay has been a staple at the regional and national levels of AMA for years and has solidified Wayne's spot as a top medical school within the AMA," Newhouse said. Llaniguez, who also is president of the WSU School of Medicine Student Senate, has held several positions in the school's AMA Chapter and Region, including as a Michigan State Medical Society representative and as its president. He also served as chair of AMA-MSS Region 5, which includes Michigan, Indiana, Kentucky, Ohio and West Virginia. "It really was because my friends and peers here at the Wayne State University School of Medicine really wanted me to share my experiences and leadership with the entire AMA," Llaniguez said. "I was humbled to have many people urge me to run for the position, and even more so to actually win an election. I am glad I can represent the School of Medicine at the national AMA-MSS level and continue to show how great we are as an institution." The two adopted policies included a collaboration between several Wayne Chapter AMA executive board members and a Johns Hopkins student advocating for appropriate use of trained medical interpreters for patients with low English proficiency, and a policy presented by the Wayne AMA Executive Board and general members that asked the AMA to advocate that religiously affiliated hospitals disclose the procedures they can and cannot perform in regard to women's reproductive health. "Both resolutions were widely applauded by our medical student colleagues and enabled us to make valuable connections at many medical schools across the country. We are currently working on several new resolutions with co-authors from the Mayo Clinic, University of Colorado and Northwestern University," said Wayne's AMA chapter President Lauren Newhouse, a member of the Class of 2020. "We were also given the opportunity to attend meetings with physicians and residents from across the country. In my short time at these meetings I met several physicians serving as heads of residency programs, and I know this was an experience shared by many Wayne students." AMA Chapter representatives also attended two regional meetings, at which the Class of 2020's Taymaz Joneydian was elected Region 5 vice chair; Tabitha Moses, an M.D./Ph.D. candidate, was elected Region 5 Membership chair; and Newhouse was elected foundation liaison to Region 5. In addition, Eric Walton, a Class of 2019 medical student, was interviewed by the Chicago Tribune for previous policy he co-wrote with School of Medicine alumnus Gunjan Malhotra, M.D., on the opioid epidemic. Read the article here. "Wayne has been an absolute powerhouse at the local, state, regional and national levels of AMA, and we are excited to continue this tradition with strong attendance at future conferences," Newhouse said, thanking several faculty members and offices for their support of the students' efforts, including Dean Jack D. Sobel, M.D. ; Vice Dean of Medical Education Richard Baker, M.D. ; Associate Dean of Student Affairs Margit Chadwell, M.D. ; and the Office of Alumni Affairs. "Our next conference will be in Hawaii in November, and fundraising efforts are well underway," Newhouse added. "We also have many exciting events planned for the upcoming year, including a networking event with physicians from nearby hospitals, a collaboration with Oakland University William Beaumont School of Medicine on a resolution-writing workshop and many other informational policy and advocacy meetings, all while continuing our many community service initiatives, including naloxone training, AMA Baptist Church mentoring and AMA Riverwalkers."